An Afro-Brazilian art form that originates from the African slaves which were brought in by the Portuguese colonies to Brazil during the 1930s . It is the marriage between dance, martial arts, rhythm and movement . Now, it is one of the most practiced forms of martial arts in the world. Though not many would take this martial arts seriously. From the surface, it looks like 2 people dancing around each other in a circle. But, in the game they are actually trying to find a way to make the other player fall down on the floor in order to win the game. Expect to see a lot of kicks, cartwheels and sometimes even some injuries. There are 2 types of capoeira, Capoeira Regional and Capoeira Angola. 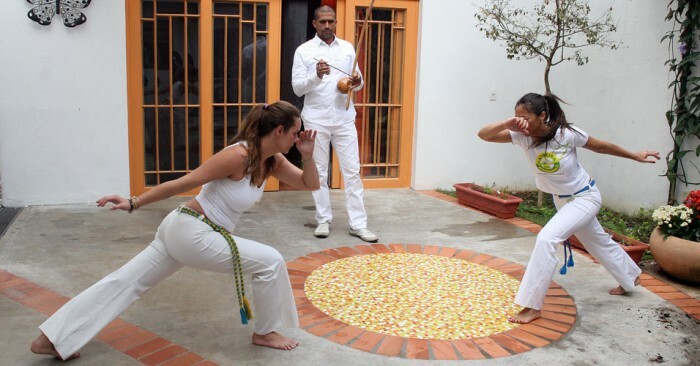 Capoeira Angola is the traditional capoeira style where the movements are slower, controlled and more grounded. While Capoeira Regional which was created after the angola style, uses systematic moves such as high kicks, aerial movements and a more defensive stance . The Regional moves are practiced more these days compare to Angola. But, certain capoeira schools teaches Angola moves to its more advance students. How does capoeira make you stronger? You will sweat buckets during most of your capoeira classes! One of the basic moves of capoeira is the Ginga. It is the foundation and it is used to transitions your moves from the start to the end. Warm ups are usually done using this move too. As you are shifting your body weight from lunges and squats alternately, your arms will be used to protect your face from any attacks . These moves will definitely help improve your stamina because during capoeira, this is the way you will walk. You’ll get stronger until you can do one hand handstands. Handstands, cartwheels and many other moves in capoeira involves your upper body strength and core. The cartwheel in capoeira is called Aú which is just like any cartwheel but it it performed slower and you have to keep your eyes on your opponent . The controlled moves will definitely work your core so the longer you practice, you will get abs. Capoeira is not just about the fancy moves, it really emphasizes on mastering the basics fundamental moves and strengthening your core. You don’t have to be young and fit to join too! Anyone can learn this art form, whether their aim is to lose weight or to learn another form of martial arts. Warm ups with push ups, crunches, and more will slowly help prepare your body to learn new moves and burn more calories. Capoeira moves are not rigid so the more you relax and move to the beat of the music, the more in-tune you are with your mind . This also helps with your mental state. 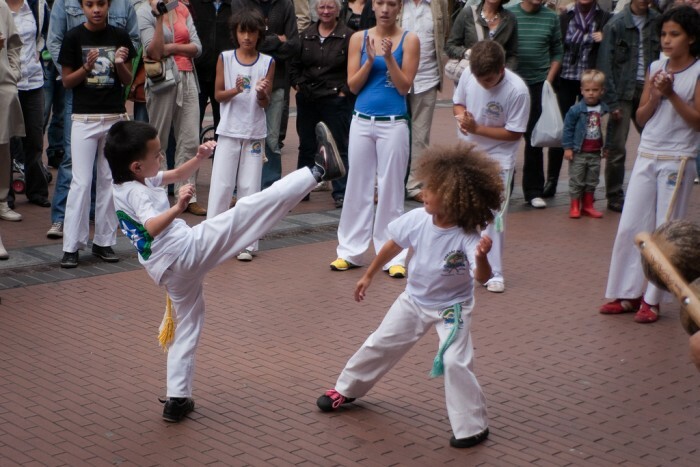 It will take time to build your reflexes but with regular practice during capoeira, you will learn to react fast. Your hand-eye coordination will also improve because your arms will be moving around your head to protect it from oncoming kicks. Escape moves such as the Esquiva (means ‘to dodge’) will help you escape from all kinds of kicks. So, learning the variations of it will keep you on your toes during a fight . The speed of the capoeira game is sometimes determined by the music that is being played. If the music has a fast beat, you’ll tend to move quicker. It is a self-defense martial art form that was used by slaves to defend themselves from their enemies. It trains you to be alert and catch any sudden movements from the other capoerista that’s playing in the roda with you. 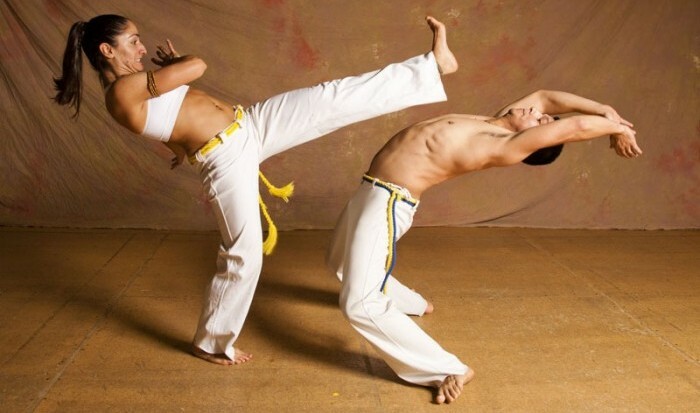 Capoeira focuses more on evading the attacks and defending until you save enough energy to take down your opponent . Taking what you learnt from capoeira to real life situations, it is best that you don’t use that opportunity to show off the acrobatic moves you could do . Save the showing off to a safer environment and defend yourself for your life. Capoeira takes the body in all directions. The moves you do such as bends, twists, curls and stretches, helps to develop mobility throughout your joints and muscles . Stretching is also important especially when you’re cooling down after a session. You might not be the most flexible for now but with patience, you can slowly build it up. Your core and back flexibility will improve as you stretch more. All in all, Capoeira is an total body workout that not only makes you stronger physically but mentally too! As you dive deeper into capoeira, you will not only learn more about the culture but you will also earn your corda (cord) which shows how much you have grown. You will also be surprised with the awesome moves that you can do with your body and the community that you will meet at the end of the day. Have you tried capoeira before? Tell us why you love it in the comments below or share them on our Facebook page! The Craze about CrossFit: Should You Get Into It?